NORTH CAROLINA -- Amy Gaston didn’t think twice about letting her 9-year-old daughter pedal her bicycle down the road to a friend’s house. After all, the family lived in base housing, well within the confines of Camp Lejeune, N.C. It’s a place where youngsters still ride bikes to school with little fear of drug dealers or predators, and neighbors generally look out for each other. But news from one of the neighborhood kids who came running up to her house on a late March afternoon in 2005 changed Gaston’s perception of base housing — and changed her family’s life. The message was short: Ashley’s hurt. She was bitten by a dog. She needs to go to the hospital. Ashley had stopped at a friend’s house to see if he could come out and play. Before she reached the door, the family’s Rottweiler escaped from its poorly secured fence, grabbed Ashley’s head in its powerful jaws and began to attack. Two-and-a-half years later, Ashley still has nightmares. She has been diagnosed with post-traumatic stress disorder. She faces three, maybe four rounds of cosmetic surgery, but doctors say that mentally, she “just wouldn’t be able to handle going through it yet,” according to her mother. Amy Gaston holds the dog’s owner and the Corps responsible. She’s seeking $5 million in damages and is hoping to send a message so that what happened to her daughter will not happen to other children living on base. In a dog-loving nation — where nearly 368,000 people are sent to emergency rooms for dog bites each year, according to the Centers for Disease Control and Prevention — Ashley’s story raises questions about allowing aggressive breeds to live in the quiet confines of family housing. For their part, Marines love dogs. That’s due, in part, to the fact that Marines are often compared to dogs. Legend holds that during World War I, German soldiers nicknamed the ferocious leathernecks they faced “Teufel Hunden,” or devil dogs. It’s a tale the Corps embraced, and before long, a bright orange recruiting poster emerged, depicting an English bulldog in a Marine helmet chasing a dachshund in a German helmet, the smaller dog fleeing with its tail between its legs. On Oct. 14, 1922, the English bulldog became the Corps’ official mascot, after then-Brig. Gen. Smedley Butler signed the enlistment papers for Pvt. Jiggs, a registered English bulldog obtained by Marines at Quantico, Va. Mainstream American culture has done its part to increase the profile of big, aggressive dogs as pets. Rapper DMX is often photographed with his pit bulls, as is actress Jessica Alba and celebrity chef Rachael Ray. Even the “Little Rascals” dog, Petey, was a pit bull, but no one seemed worried for Alfalfa’s safety. Despite the worldwide debate over pit bulls, the breed is the most popular at Camp Lejeune, according to base registration records. Sgt. Chris Polarbear received his pit bull, Bluto, as a homecoming present from Iraq. During an afternoon of playtime at a dog park that opened recently in the Midway Park housing area, Bluto strolled around, accepting pats from strangers. The 65-pound dog was the runt of the litter, but he still tends to intimidate any strangers he and his owner encounter. After pit bulls, Lejeune Marines favor Labrador retrievers and Chihuahuas. Residents of Camp Pendleton, Calif., housing favor Labs most. Lab mixes and terrier breeds, excluding pit bulls, are also among the most popular there, according to base animal control officials. At Marine Corps Air Station Cherry Point, N.C., it’s Labs, boxers and Australian shepherds. The Corps’ beloved mascot, the English bulldog, likely doesn’t make it to the top of the lists because they tend to be expensive and have their share of health problems, including poor eyesight, breathing problems, susceptibility to heat and extreme sensitivity to cold. Only Marine Corps Base Kaneohe Bay, Hawaii, prohibits pit bulls on base. Other military services on the island do the same thing. Polarbear would be lost there, as he and Bluto are inseparable. They visit the Wounded Warrior Barracks. They go bar hopping. Polarbear said he’s made a point to expose his dog to other people and other dogs. The attack on Ashley Gaston came out of nowhere, however, and was by a dog used to having a kid around. When Ashley’s father, a staff sergeant, came home carrying his daughter in his arms, her honey-colored hair was matted with a mixture of blood and flesh. 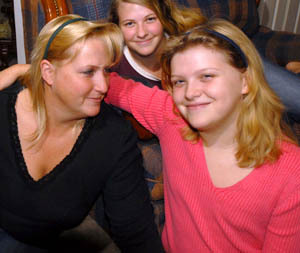 Amy Gaston lifted Ashley’s hair from the right side of her head to get answers. What she found makes her cry even today. “Part of her E-A-R is gone,” she recalls saying to Ashley’s father, spelling the word to avoid shocking the child further. As Ashley’s father put her into the car to make the trip to Naval Hospital Camp Lejeune, just down the road from their home, Amy Gaston carried the severed portion of her daughter’s ear to the kitchen and put it into a bag of ice. Ashley remained in the hospital for nearly a week. But before she was released, and just two days after her first surgery, her father deployed to Iraq. The attack left Ashley with a gash on the right side of her neck, a severed section of her right ear and puncture wounds to her right shoulder and forearm. Today, if you didn’t know she had been attacked by a dog, you might not notice. But her family notices, she notices and kids at school notice. A faint scar runs the length of her right jaw line. The portion of her ear that was severed was reattached, but she needs reconstructive surgery. 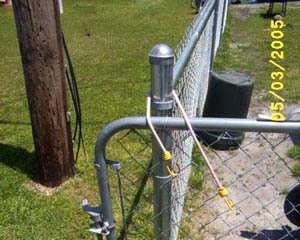 It was in the days after the attack that Amy Gaston learned that the gate on the fence where the dog lived was secured by a single, elastic bungee cord, according to court documents. The gate was eight inches longer than the gate opening. That combination allowed the dog to escape and attack Ashley from behind, according to court documents. Amy Gaston said the boy who lived at the house rode up on his bike during the attack. When the dog saw him, it retreated to the backyard, she said. After the attack was reported to the base Provost Marshal’s Office, the dog was put down. The Gastons were new to the Lejeune neighborhood when the attack occurred. They had recently moved from Washington, D.C., where they lived in Bellevue Naval Housing. Her attorney, David Sheldon, says the government is responsible. “Had they done their job, she wouldn’t have been attacked,” he said. Regulations require that the base housing office approve fencing for all domestic animals, he said, adding that they failed to inspect the fence. The lawsuit also argues that the defendant, a staff sergeant assigned to 2nd Marine Aircraft Wing, did not request a fencing inspection. Attempts to reach the staff sergeant for comment were unsuccessful. Amy Gaston and her husband are now separated; she and her three children eventually moved to Upper Marlboro, Md., where the lawsuit was filed in U.S. district court. The government filed a motion to dismiss the case in September, arguing that, under a North Carolina law, the government can’t be held liable for an alleged failure to enforce statutory regulations. The motion also states that the government did not know of any aggressive tendencies in the dog. Base housing and dogs: Marine bases regulate pet ownership in base housing. Dogs and cats must be registered with base veterinary or animal control offices. Dogs are prohibited from running free. But some military bases have gone a step further, prohibiting certain breeds altogether. Air Force Space Command passed an aggressive-dog policy in 2006 that prohibits pit bull and Rottweiler breeds from living in base housing. Fort Benning, an Army base in Georgia, has a pet policy restricting animals that weigh more than 100 pounds and specifically prohibits pit bulls, Rottweilers, Doberman Pinschers and chow chows. McGuire Air Force Base and neighboring Fort Dix in New Jersey also restrict pit bulls, Rottweilers and Dobermans. Owners of these breeds argue the dogs get a bad rap in the media. With the right training and a good environment, breeds that have aggressive tendencies can be fine pets, animal experts say. But the numbers are hard to ignore. 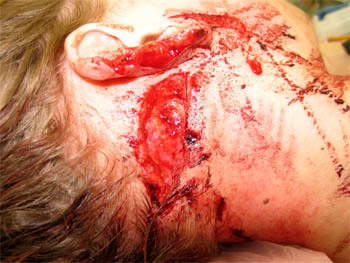 Animal People, a publication for animal activists, conducted a study of dog attack deaths and maimings in the U.S. and Canada between September 1982 and November 2006. Of the more than 80 breeds included in the study, pit bulls, Rottweilers, Presa Canarios (often called bull mastiffs) and their mixes were responsible for 74 percent of reported attacks analyzed. As for the Gastons, they’ve had Alex, a Jack Russell terrier, in their lives for almost 11 years. ILLINOIS -- The two pit bulls who mauled an 8-year-old Roseland boy in his parents' yard have been given to the city by their owners to be euthanized, a city official said. Joshua Dixon of the 10100 block of South State Street was attacked by his family's two pit bulls inside his home's gated yard Wednesday evening, police said. Joshua was returning from school when he was attacked. The dogs knocked the boy down and bit him multiple times, injuring his face, police said. From Animal Care and Control's investigation, it appears that both dogs -- one male, one female -- bit the boy during the attack, said Mark Rosenthal, the operations manager at Animal Care and Control. "I think it was ... somewhat of a chaotic situation," Rosenthal said. He was taken to the University of Chicago Comer Children's Hospital, where he remained in critical condition Thursday, hospital spokesman John Easton said. Family members who were contacted declined to comment. By law, dogs that bite other dogs or humans must be quarantined for 10 days to be checked for rabies, Rosenthal said. But because the owners of the dogs relinquished custody of them to Animal Care and Control, they will be euthanized, Rosenthal said. "They are biting dogs involved in a very severe mauling," Rosenthal said. "There's no rescue agency or no home that we would feel comfortable placing the dogs in." After the pair is euthanized, their heads will be sent to a city laboratory so they can be checked for rabies. Chicago has a large pit bull population, and many of those dogs end up in Animal Care and Control's custody, Rosenthal said. "Obviously, pit bulls are different than dachshunds or Malteses, or a big, physical dog," Rosenthal said. "They have the potential to do damage if they are in a situation where there's a bite involved. ... Owners have to assume responsibility for their animals, be it a snake, a dog or a cat." OHIO -- A Huron County sheriff’s deputy was ordered to shoot and kill one of two aggressive Rottweiler dogs that attacked and bit an Old State Road man Monday afternoon. “I hated the idea of killing that dog. I didn’t have a choice,” Detective Sgt. Dane Howard said. The second dog is being held and quarantined at the Huron County Dog Pound. Ousley said he wasn’t at liberty to discuss what citations the dog owner was given because of the ongoing investigation. The probe is expected to be concluded by next Tuesday or Wednesday. No charges had been filed in Norwalk Municipal Court as of this morning. A message at the dog owner’s telephone number said it had either been disconnected or was no longer in service. Howard was on the way home when he received an animal complaint report about 2:45 p.m.
“The man ran inside his home … and the dogs tried to get into the patio,” the detective said. The victim, who declined to comment, sustained puncture wounds to his hand. He went to Fisher-Titus Medical Center, where he was treated and released. The victim lives on the south side of the dog owner. When he arrived in the 100 block of Old State Road, Howard said one of the dogs charged at him, but he was able to get back into his vehicle. Englund fired his pistol at one of the dogs, but didn’t hit it. Howard said the dogs returned to the porch. Since the animals were still being aggressive, deputies decided to use their Tasers. Howard said he and Englund fired their weapons at the same time, but they weren’t effective because one of the dogs rolled into the other one, tearing the Taser cable loose. “The Taser reactivates after five seconds,” Howard explained. One of the dogs fled. Englund reloaded his Taser cartridge and fired the weapon again at the remaining dog. Englund then ordered Howard to “dispatch the animal” with his service pistol, the detective said, which killed it. Troopers with the state Highway Patrol saw the fleeing dog in the front of the victim’s home near a van. Ousley found and secured the animal. One of the dogs also bit the lip of a sheep kept in the same pen, Rospert said. His family told his neighbor’s wife about the killed goats. “She saw them (the dogs) in there, too. She said they’d put them down, but that didn’t happen,” Rospert said. In November, he spent about $6,000 to put up a fence to keep the dogs out of his property. Rospert said their presence has caused his family emotional distress. Ousley said it would be up to Norwalk Municipal Judge John Ridge to determine if the dog being quarantined might be destroyed.